It was in 2005 at Waterkant Jam, a Lindy Hop festival in Hamburg Germany. Lennart Westerlund, yes THE Lennart, was teaching a musicality class with live band. He was talking about the structure of jazz and the band was playing what he was talking about. I would say, to have a live band in class was at that time quite unique. If you know Lennart, then you know that he does things always a little bit differently. So, he was talking about the AABA structure. 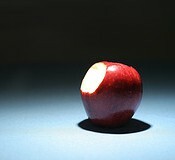 Therefore he lined up three apples and another fruit as a visual example. Then he started to eat pieces of two apples to illustrate, that not all of the ‘A's in the AABA structure are exactly the same. Could one show you that in a more memorable way? “Learn about the AABA jazz form” is the seventh tip in my article “33 Actions & Tips To Become A Better Swing Dancer“. The interest in this tip is huge, reason enough to examine the AABA form in a separate article. After the introduction, we will take a look at the theory. Then we will listen to an example, where the AABA form is used. And finally, you will learn a basic idea, how to implement AABA into the dance by using a simple routine. The AABA form was style-defining for the popular music of the United States. It is the basic form of most of the so-called Tin Pan Alley songs. Tin Pan Alley was the nickname of the 28th Street between Fifth and Sixth Avenue in Manhattan New York. Between ca. 1895 and 1930, a majority of music publishers were settled in this district and responsible for the flourish of the American popular song during that time. Many songwriters and composers worked for these publishers. 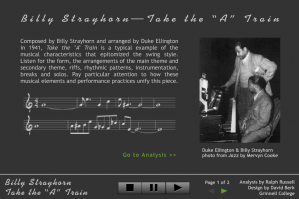 The songs were published as sheet music, the base for an essential part of the Jazz standard repertoire. 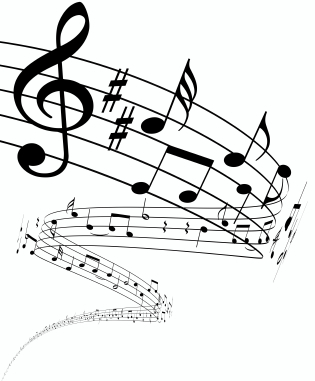 Many of the so-called jazz standards (and thousands of more tunes) are written in the AABA form. The AABA form usually consists of 32 bars. The first two A sections (A1 and A2) are verses with similar chords and a similar melody, while the lyrics may change. The following bridge builds a contrast to the A sections using different chords, a different melody and different lyrics, before it is transitioning to another A. This last A section (A3) repeats the first two A's with similar chords and a similar melody. The lyrics may be different or one verse may be repeated. Important to know for us dancers: musicians always count on 4 while we are counting on 8. With that said: 8 bars = 4 eights. Note: While writing this section, I coincidentally found a great analysis of exactly that song. You learn visually, how the song is structured and which instruments are playing at the moment while listening to the song. So, I decided to shorten this part and only to describe the structure. I strongly recommend you to head over to the Take The ‘A' Train Analysis before reading on. Here is a basic idea, how you can implement the newly acquired knowledge into your dance. I guess, you get the idea: We rebuild the AABA form with different Lindy moves. A sections are danced with swingouts and variations of them: A1 and A2 are similar, but not exactly the same. The bridge is done with side-by-side charleston to contrast the A's, and A3 is the exact copy of A2 to show the relation to each other. When we do something like this, then we talk about “macro musicality“. If you feel comfortable with building four eights sections, then you can start to create more complicated variations. With the time, you don't only dance the main melody, you become a soloist, who improvises freely without loosing the structure, like the musicians in any of these songs! How do You implement the AABA form into your dance? I would love to read your stories in the comment section below. How did you learn to implement the AABA form? How would you teach it? Any other ideas to the topic?